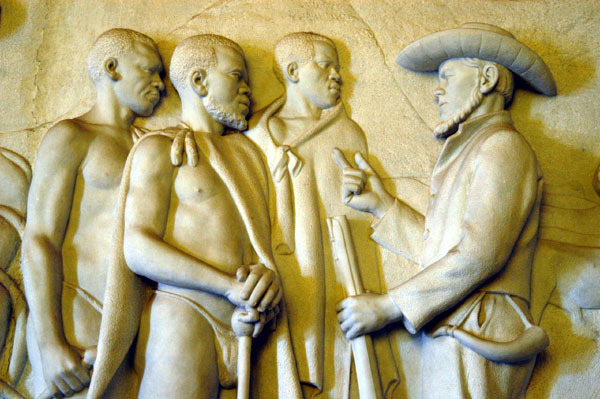 The idea to build a monument in honour of the Voortrekkers was first discussed on 16 December 1888, when President Paul Kruger of the South African Republic attended the Day of the Covenant celebrations at Blood River in Natal. However, the movement to actually build such a monument only started in 1931 when the Sentrale Volksmonumentekomitee (SVK) (Central People's Monuments Committee) was formed to bring this idea to fruition.Construction started on 13 July 1937 with a sod turning ceremony performed by chairman of the SVK, Advocate Ernest George Jansen, on what later became known as Monument Hill. 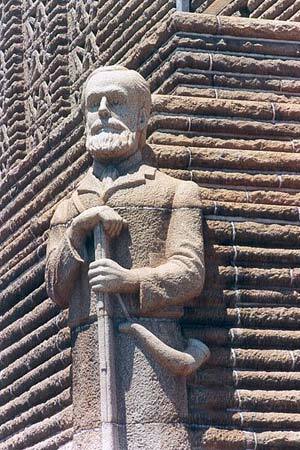 On 16 December 1938 the cornerstone was laid by three descendants of some of the Voortrekker leaders: Mrs. J.C. Muller (granddaughter of Andries Pretorius), Mrs. K.F. 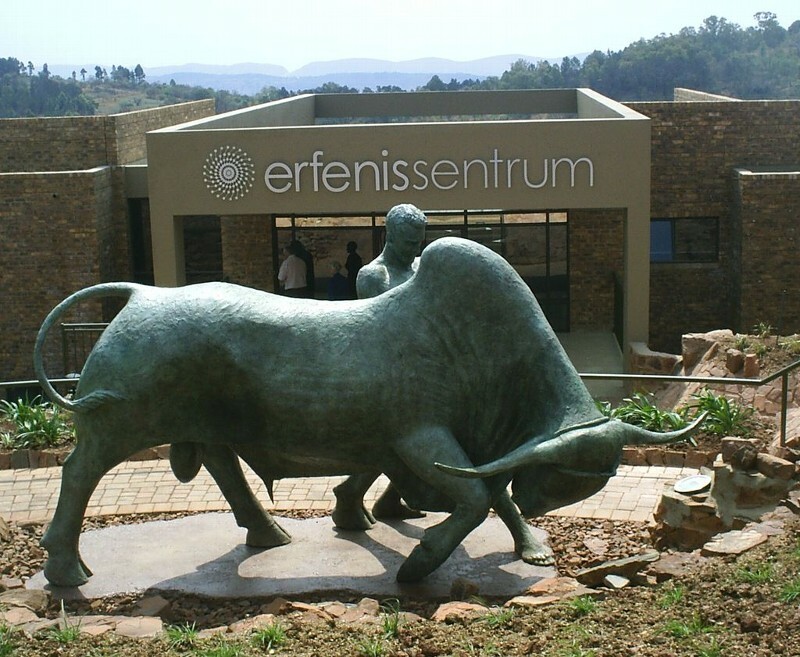 Ackerman (great-granddaughter of Hendrik Potgieter) and Mrs. J.C. Preller (great-granddaughter of Piet Retief).The Monument was inaugurated on 16 December 1949 by the then-prime minister D. F. Malan.The total construction cost of the Monument was about £ 360,000, most of which was contributed by the South African government.A large amphitheatre, which seats approximately 20,000 people, was erected to the north-east of the Monument in 1949. 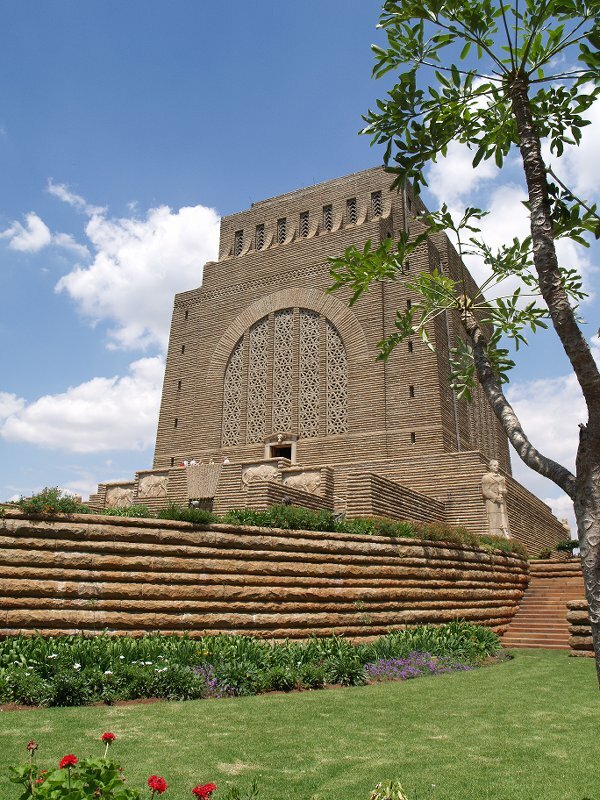 Physically, the Voortrekker Monument is 40 metres high, with a base of 40 metres by 40 metres.The building shares architectural resemblance with European monuments such the Dôme des Invalids in France and the Völkerschlachtdenkmal in Germany but also contain African influences.The two main points of interest inside the building are the Historical Frieze and the Cenotaph. The main entrance of the building leads into the domed Hall of Heroes. 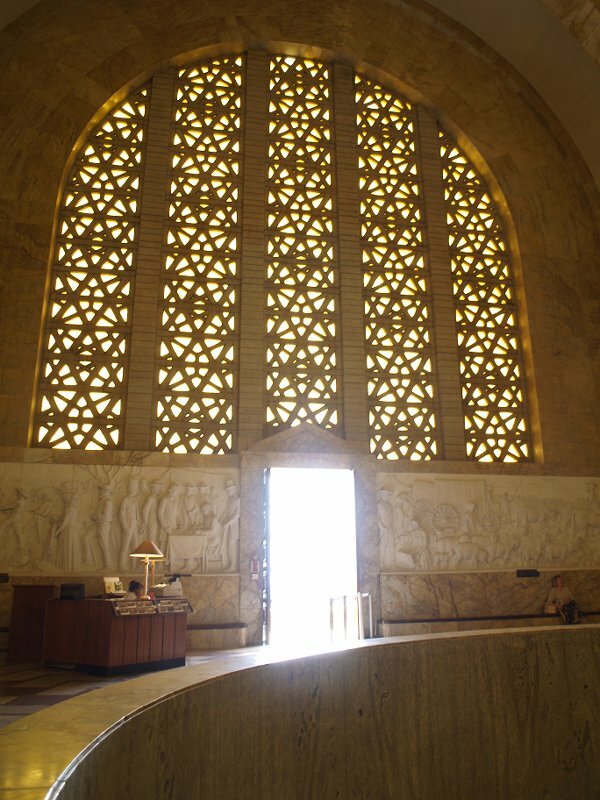 This massive space, flanked by four huge arched windows made from yellow Belgian glass, contains the unique marble Historical Frieze which is an intrinsic part of the design of the monument. 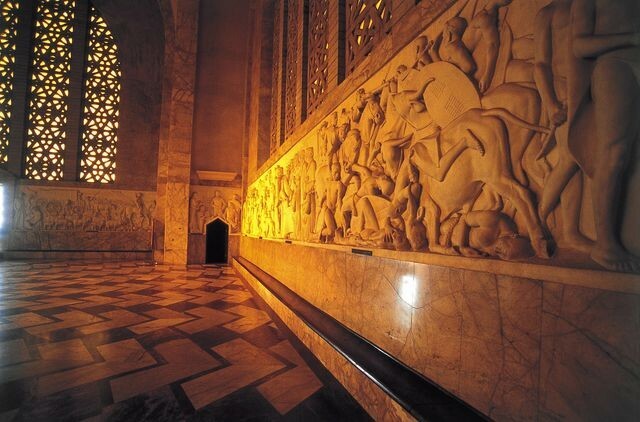 It is the biggest marble frieze in the world.The frieze consists of 27 bas-relief panels depicting the history of the Great Trek, but incorporating references to every day life, work methods and religious beliefs of the Voortrekkers. 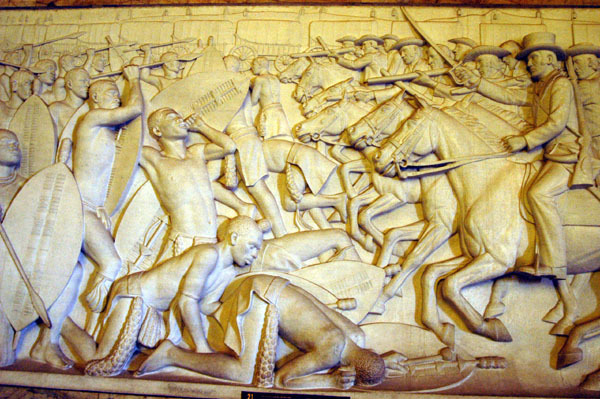 The set of panels illustrate key historical scenes starting from the first voortrekkers of 1835, up to the signing of the Sand River Convention in 1852. 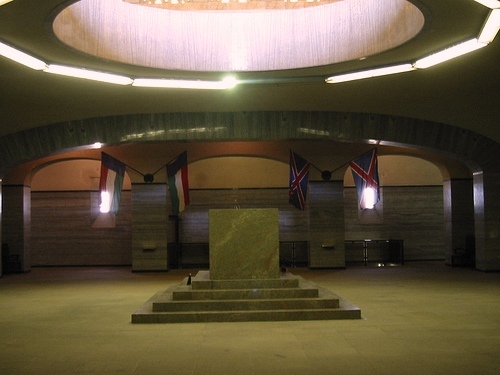 In the centre of the floor of the Hall of Heroes is a large circular opening through which the Cenotaph in the Cenotaph Hall can be viewed. 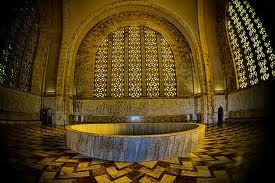 The Cenotaph, situated in the centre of the Cenotaph Hall, is the central focus of the monument. 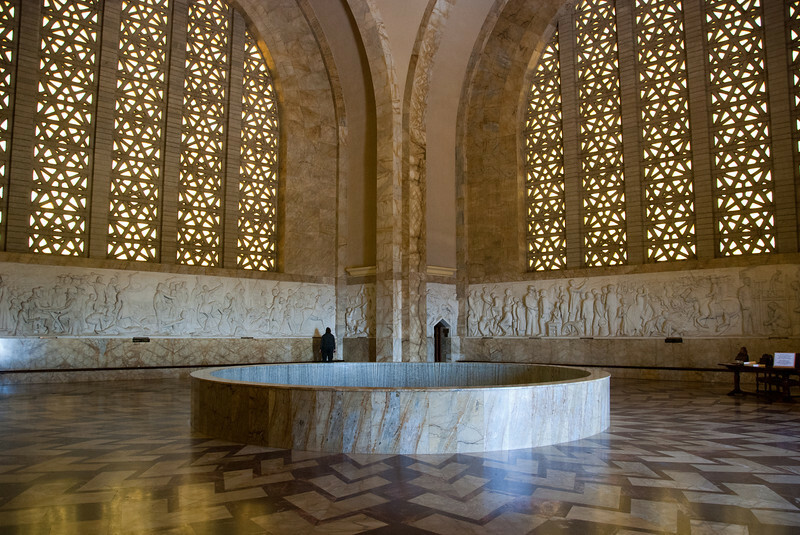 In addition to being viewable from the Hall of Heroes it can also be seen from the dome at the top of the building, from where much of the interior of the monument can be viewed. 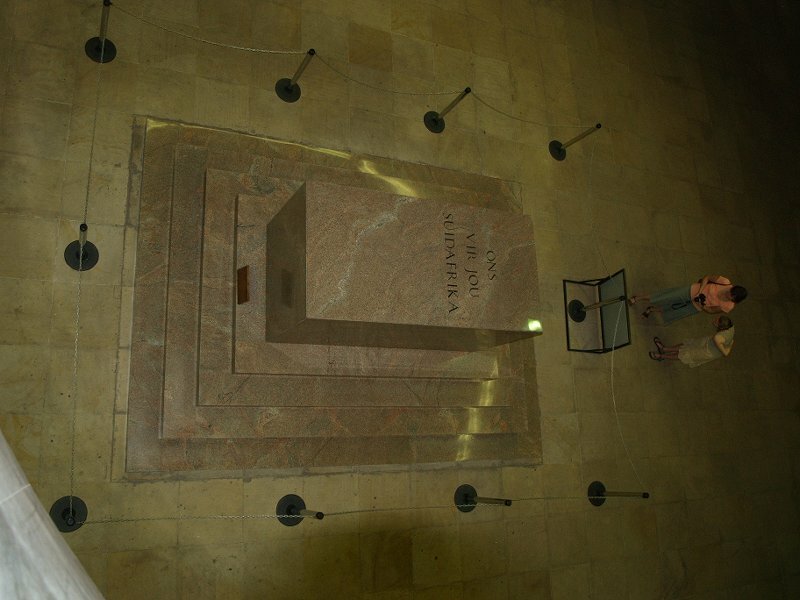 Through an opening in this dome a ray of sunlight shines at twelve o'clock on 16 December annually, falling onto the centre of the Cenotaph, striking the words 'Ons vir Jou, Suid-Afrika' (Afrikaans for 'We for Thee, South Africa'). 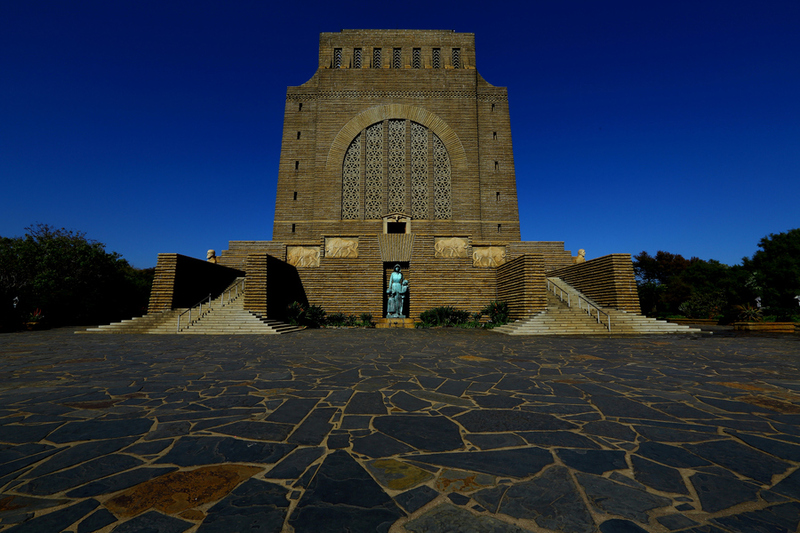 The ray of light is said to symbolise God's blessing on the lives and endeavours of the Voortrekkers. 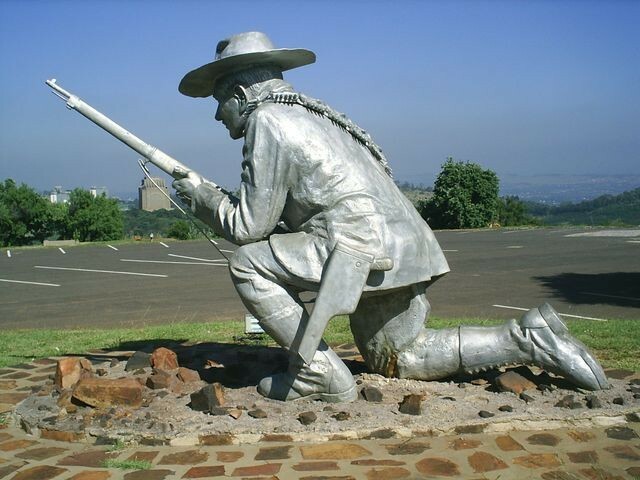 16 December 1838 was the date of the Battle of Blood River, commemorated in South Africa before 1994 as the Day of the Vow. 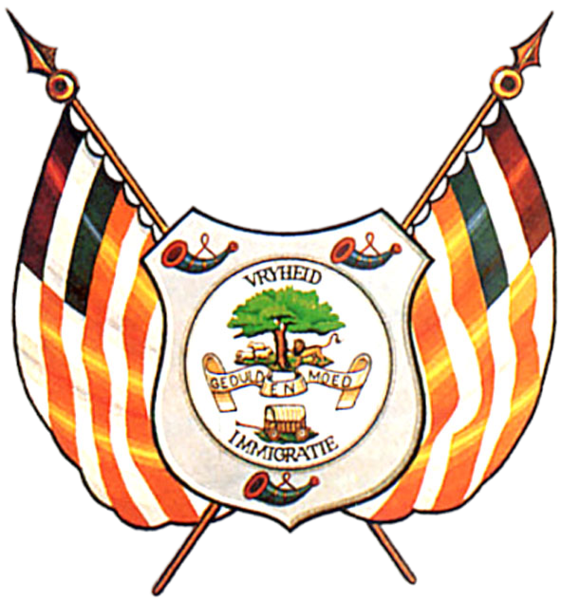 The Cenotaph Hall is decorated with the flags of the different Voortrekker Republics and contains wall tapestries depicting the Voortrekkers as well as several display cases with artefacts from the Great Trek. Against the northern wall of the hall is a nave with a lantern in which a flame has been kept burning ever since 1938. 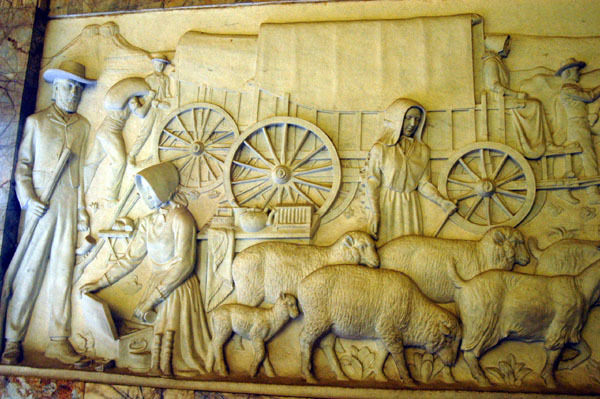 It was in that year that the Symbolic Ox Wagon Trek, which started in Cape Town and ended at Monument Hill where the Monument's foundation stone was laid, took place. 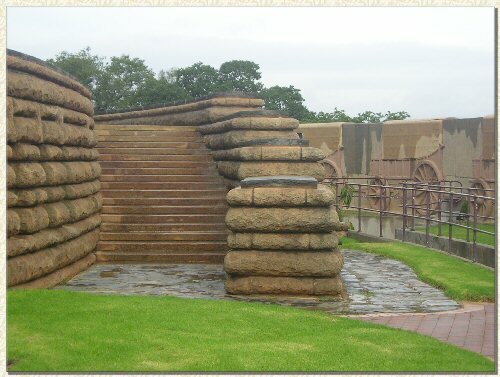 Visitors to the monument enter through a black wrought iron gate with an assegai (spear) motif.After passing through the gate one finds oneself inside a big laager consisting of 64 ox-wagons made out of decorative granite. The same number of wagons were used at the Battle of Blood River to form the laager. 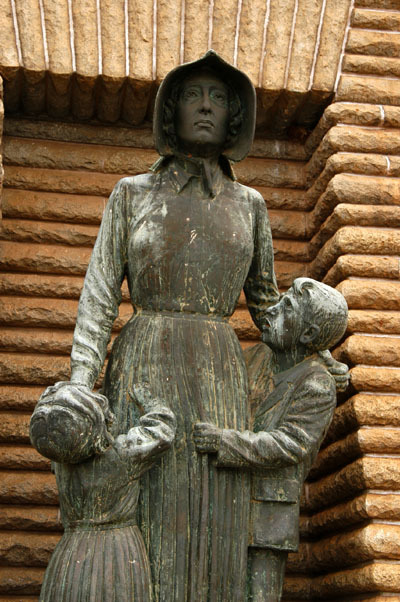 At the foot of the Monument stands Anton van Wouw's bronze sculpture of a Voortrekker woman and her two children, paying homage to the strength and courage of the Voortrekker women. 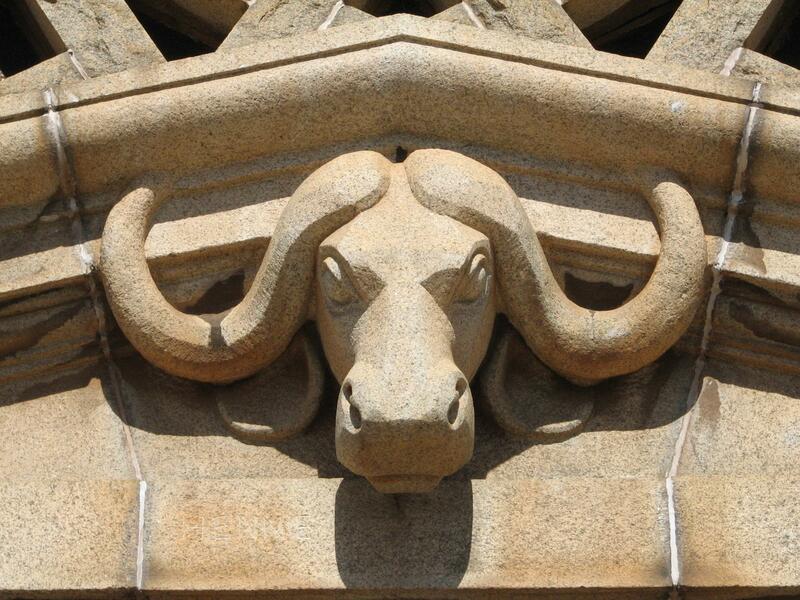 On both sides of this sculpture black wildebeest are chiselled into the walls of the Monument. The wildebeest symbolically depicts the dangers of Africa and their symbolic flight implies that the woman, carrier of Western civilisation, is triumphant. 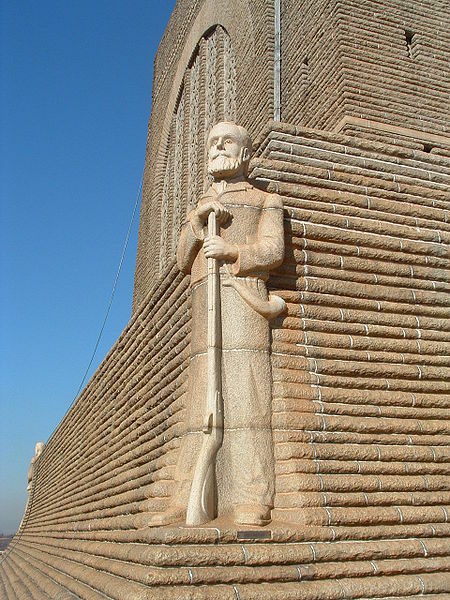 of the Monument there is a statue, respectively representing Piet Retief, Andries Pretorius, Hendrik Potgieter and an "unknown" leader (representative of all the other Voortrekker leaders). 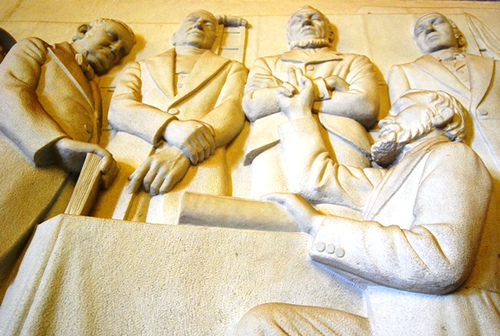 Each statue weighs approximately 6 tons.At the eastern corner of the monument, on the same level as its entrance, is the foundation stone.Under the foundation stone is buried: A copy of the Trekker Vow on 16 December 1838. 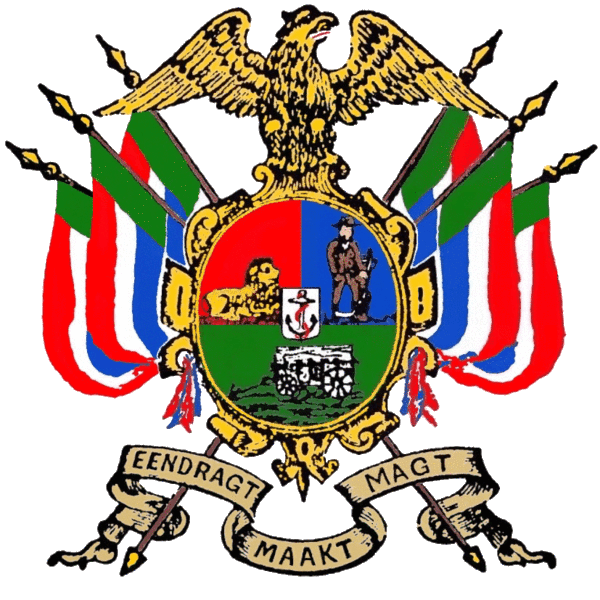 A copy of the anthem "Die Stem". 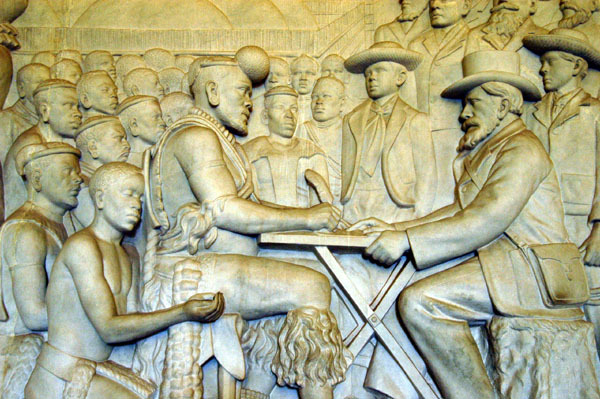 A copy of the land deal between the Trekkers under Piet Retief and the Zulus under king Dingaan. 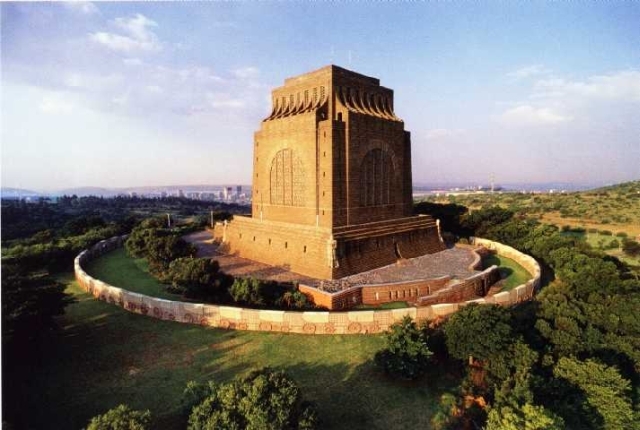 According to Dr Alta Steenkamp, the masonic subtext of the Völkerschlachtdenkmal is reflected in the Voortrekker Monument because the architect, Gerard Moerdijk, had used the geometric order and spatial proportions of the Völkerschlachtdenkmal.This Germanisation of the Voortrekker Monument occurred, after Moerdijk's initial design had caused a public outcry in the South African press for its resemblance to an Egyptian temple. Moerdijk's 1936 Germanised "Mansion of the Benben" with mid noon sun shining on an encrypted stone.In Moerdijk's initial design, the monument consisted of a causeway linking two Egyptian obelisks. 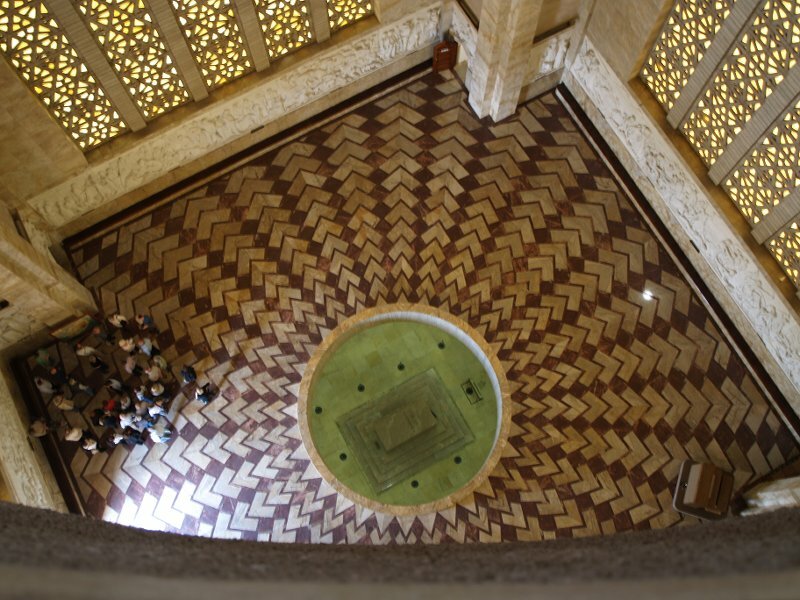 Looking from the sky dome downwards, a chevron pattern on the floor of the Hall of Heroes, radiates outwards like 32 sun rays. In Moerdijk's architecture, the natural sun forms the 33rd ray through the floor opening.Moerdijk said the chevron pattern on the floor depicts water, as does the double chevron hieroglyph from the civilization of ancient Egypt.Moerdijk stated that all roads on the terrain of building art, lead back to ancient Egypt.Based on Moerdijk's reference to the watery floor of the Hall of Heroes, as well as his statements about ancient Egypt, the floor opening may be identified with the watery abyss, as in the creation theology of ancient African civilization. Rising out of this watery abyss, was the primeval mound, the Benben stone, to symbolize a new creation. 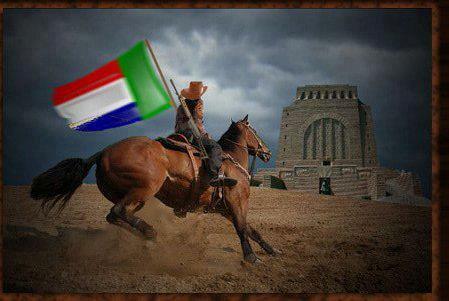 Protestant churches in South Africa. Moerdijk adhered to Reformed church tradition and thus his Renaissance trademark, the Greek-cross floorplan, always focused on the pulpit and preacher. 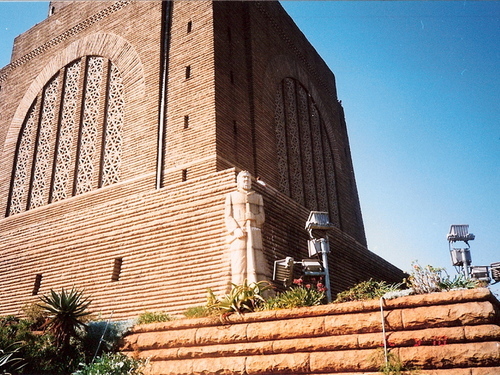 In Protestant theology, the word of God is central.Moerdijk created a similar central focus in the Voortrekker Monument, but in vertical instead of horisontal plane, and in African instead of European style.Thus the sun ray simulates a connection between the words on the Cenotaph and the heavenly abode above, a communication between God and man.The actual sun ray itself forms a 33rd sun ray shining onto the stone in the midst of floor opening. In Moerdijk's biblical theology, God communicates in two ways: through scripture and nature. Moerdijk merges both methods, by using the sun in his simulation. The Vow of the Trekkers was commemorated on 16 December as the Day of the Vow. On 16 December, the appearance of an illuminating sun disc on the wording of the Cenotaph stone, transform their meaning as per the Philosophers Stone of the alchemists.Instead of man below making an earthly vow, the sun shifts the focus upwards to the trinitarian god of the Trekkers, as it is God who communicates through Moerdijk's sun architecture, making Himself a heavenly vow with the words: WE - as in GOD - FOR THEE SOUTH-AFRICA.Thus God in the trinitarian tradition of the Trekkers, speaks a vow within the sun disc illuminating the words on the Cenotaph.The Trekker belief that God was for South Africa, originates from the 9-16 December 1838 vow of Trekker leader Andries Pretorius at Danskraal, who at around the same time made military and political alliances with Christian Zulus like prince Mpande. 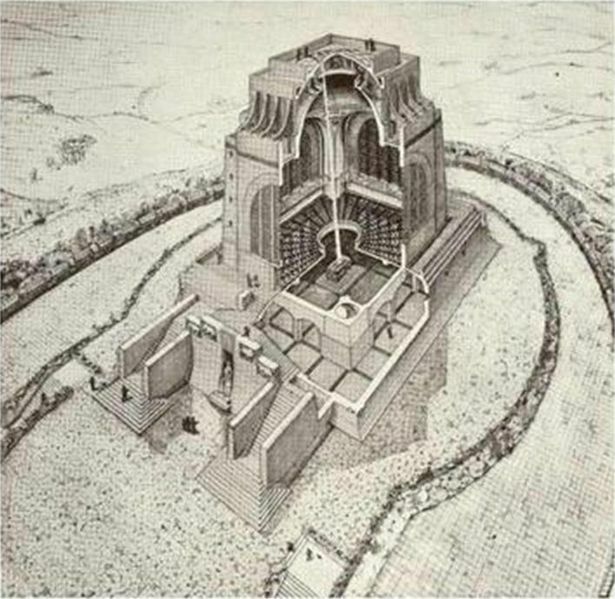 Moerdijk was an outspoken supporter of ancient Egyptian architecture.Moerdijk referred to Africa's greatness as imparted by ancient Egyptian constructions at the inauguration of the Voortrekker Monument.Before his Voortrekker Monument proposal was accepted, Moerdijk and Anton van Wouw had been working in alliance for many years on their "dream castle" project:a modern African-Egytian Voortrekker Temple in South-Africa. 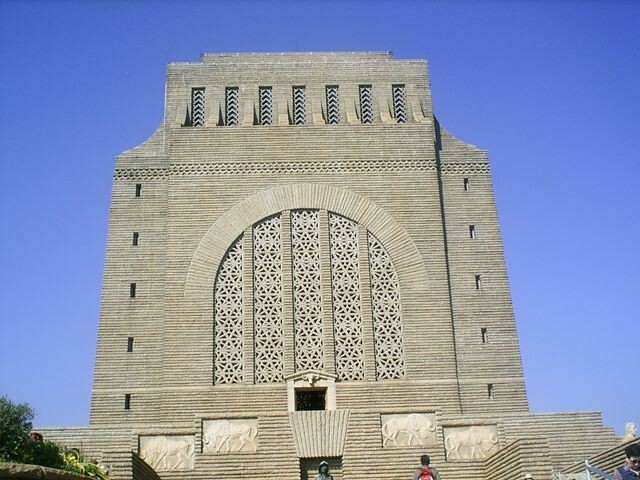 Van Wouw and Frans Soff had earlier employed the Egyptian obelisk, a petrified ray of the African Aten, as central motif for the National Women's Monument in Bloemfontein, South Africa, itself likewise inaugurated on the Day of the Vow, 16 December 1913. 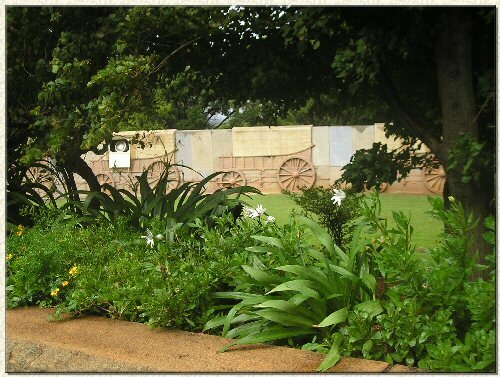 An indigenous garden that surrounds the monument. 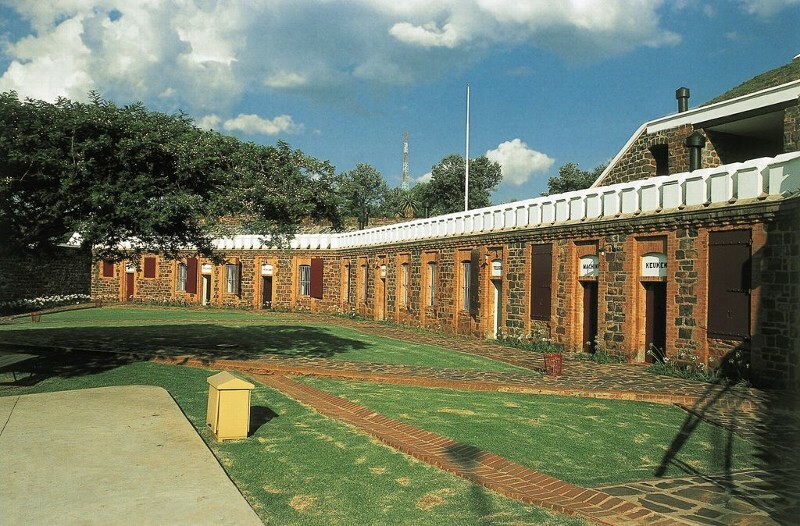 Fort Schanskop, a nearby fort built in 1897 by the government of the South African Republic after the Jameson Raid and now a museum. 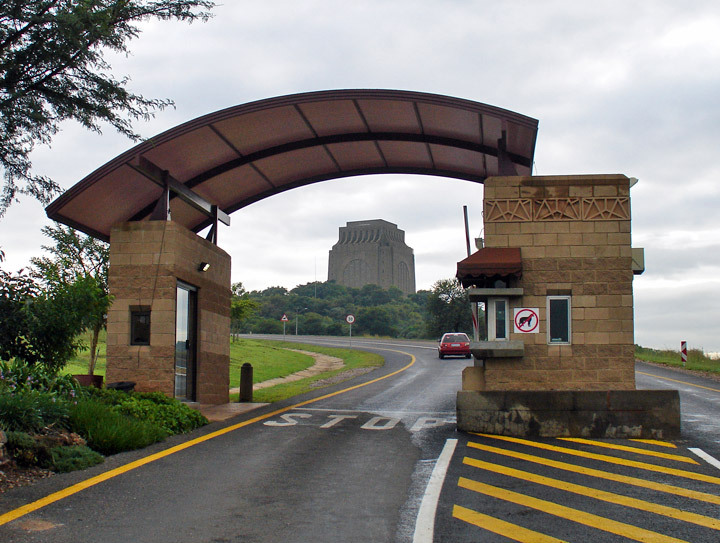 The Schanskop open-air amphitheatre with seating for 357 people that was officially opened on 30 January 2001. A nature reserve was declared on 3.41 km² around the Monument in 1992. Game found on the reserve include Zebras, Blesbok, Mountain Reedbuck, Springbok and Impala. 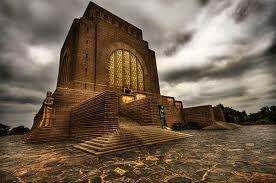 You Can visit our Picture Gallery,Their you will find alot of Picture of the Voortrekker Monument. 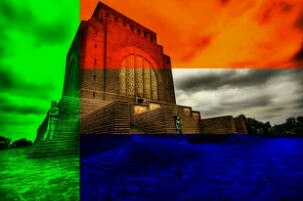 ENJOY THE WONDERFULL BUILDING WHAT STAND ON TOP OF THE HILL IN PRETORIA IN SOUTH AFRICA. 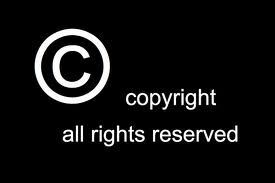 Andy Dezius - Senior Webmaster Designer Andy Dezius - Grafic Designer and Homepage Layout , @copyright 2018. Homepage-baukasten.de. - Homepage Maintainer In Germany.